Here’s how to make bison jerky. northfork bison jerky is delicious. It’s a healthy high energy snack that can be packed and munched almost anywhere. This recipe originally comes Vancouver butcher Sebastian Cortez of Sebastian & Co. Fine Organic Meats for beef jerky. It can easily be adapted into bison jerky. Eye of round is a less expensive cut of meat. The cooking time is long about 6 hours. So pick a day you’ll be staying home. Today is a great day for it, since we are having a huge winter blizzard / freezing rain / high winds. Trim any fat off the eye of round, and slice into ¼-inch thick strips, about 4 inches long and 1 inch wide. Combine the bison with all other ingredients in a large mixing bowl. Cover and refrigerate for 2 days. Remove the bison from the marinade, and lay the strips on a wire rack. Place the rack on a foil-lined baking sheet, and bake 6 to 8 hours, until the beef is dry but still flexible. 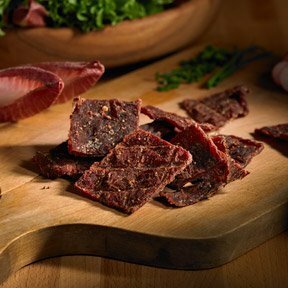 Store the jerky in sealable plastic bags or an air-tight container. And voila, jerky. Great to take along on hikes or X-Country skiing.